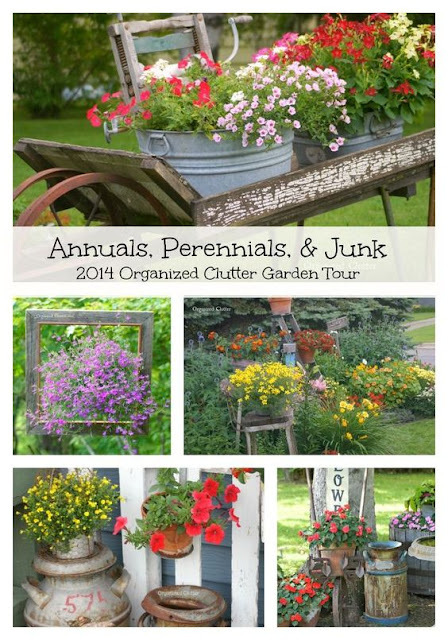 Welcome to Organized Clutter's 2014 Junk Garden Tour! This year I asked my friend and coworker, Val, to photograph my tour. Val has a great camera, and is a great photographer. So sit back and view my gardens through her eyes and her lens. The macros are amazing! The decor is always vintage and rustic! Swing Time fuchsia and Creeping Jenny in galvanized pail. Red calibrachoa planted in a watering can. Rusty milk cans in front of a chippy picket fence. Mercardonia under the cloche and a trailing red petunia in the terracotta pot. Front corner of the house. My vintage bike with shade annuals. Chippy wheelbarrow with nicotiana, verbena and calibrachoa in tubs. Bidens on an old stool in the garden. An annual, perennial and junk garden. Funnel, pail, and oil cans with fuchsia and mimulous. More fuchsias and a rustic reclaimed wood and barbed wire flag. A rusty spring holds a pail of impatiens. More impatiens under the tree. Junky container vignettes along the deck. Sempervivum and Angelina sedum. A view of the deck. A pot lid collection displayed on an old barn door. Hostas along the house, a garden angel, and a collection of glass clippers on a gate. Re-purposed Jello mold toad stools with bacopa, sweet potato vine and sun patiens. Red verbena, bidens and calibrachoa. A rosette iron re purposed butterfly flower pick. Clematis in the back of the house. Thanks for looking! I hope you enjoyed the tour! 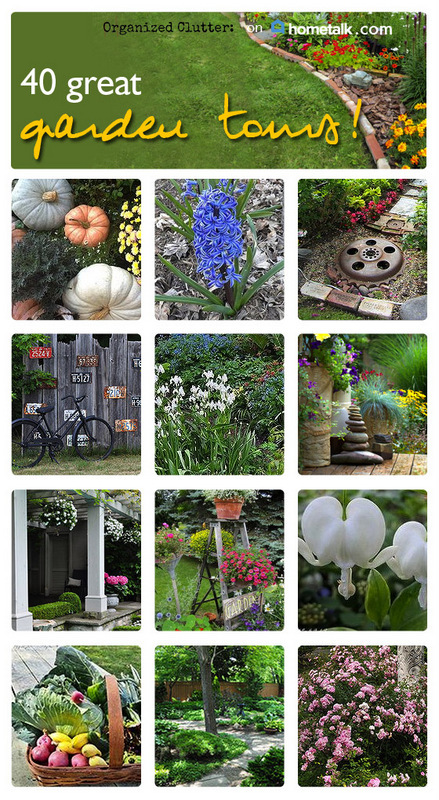 Follow my new Great Garden Tour Clipboard on Hometalk! You've really outdone yourself, Carlene! I love the big flower bed with your ladder. The globe thistle are one of my faves, and I've got to plant some next year. Lots of great ideas in your tour. Thanks for sharing and enjoy! Amazing, beautiful, stunning. Wow, I am in love with your gardens. 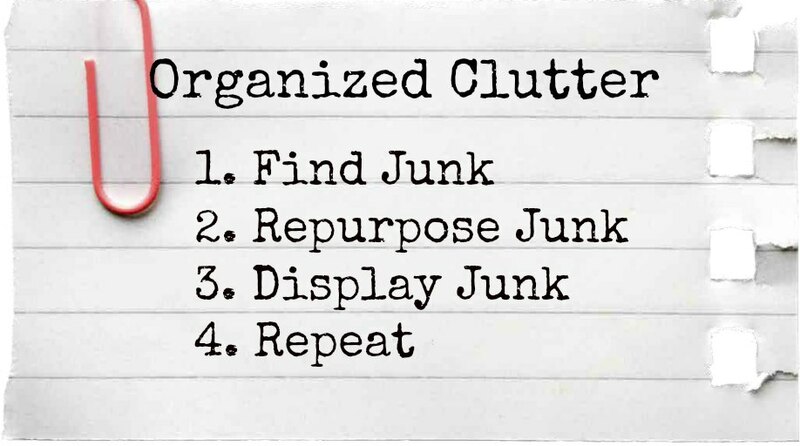 And it all looks organized. The globe thistle picture was stunning. You are right, she is a good photographer. You need to publish a book or make these photos into prints or note cards. Loved seeing the tour of your Junk Garden....so beautiful!! You have the best junk ever!! beautiful pictures. i don't know which is my favorite but i love the color of that bike! if you painted it, could you tell me what color it is? thanks so much for the inspiration. You always have the BEST garden on the net each summer! Your tour and the way you vignette your junk absolutely rocks! Thanks for the amazing eye candy! You are a total stand out in this category, Carlene! Everything looks so pretty and fresh and colorful. Thanks for the tour! Love, love love!!! I've been having a problem getting your posts via email and thought you hadn't been posting, so I had to come find you. When I try to re-subscribe, feedburner tells me I'm already a subscriber. I think I like the Rusty Rooster and the well hand pump the best but not sure as there are so many items and flowers. If I ever go past your beautiful gardens, I am stopping! You might find me out there oohhh ing and aahhhh ing over the different gardens. then i will start all over because I am sure that i missed something! You have beautiful and amazing "junk" and gardens. Such fun ! This is my kind of place ! Glad you could share it. Makes me "pine" for warm weather !! !